Tag line: "The most amazing science fiction ever conceived!" As a kid, I thought Fantastic Voyage had one of the coolest concepts ever for motion picture: a group of doctors shrink themselves and perform an operation while inside their patient. Seriously, how awesome is that? A botched assassination leaves noted scientist Jan Benes (Jean Del Val) in a coma, suffering from a severe brain clot. In an effort to save him, Special Agent Charles Grant (Stephen Boyd) joins brain surgeon Dr. Duval (Arthur Kennedy), his assistant, Cora (Rachel Welch), and Dr. Michaels (Donald Pleasance) as they attempt an experimental procedure, one that, if successful, will completely remove the clot. The four, along with Captain Bill Owens (William Redfield), climb aboard a submarine nicknamed the “Proteus”, which is then shrunk down to microscopic size and injected, by way of a hypodermic needle, into Benes’s bloodstream. Once inside, the team has exactly one hour to complete the procedure before the miniaturization wears off, and the “Proteus” and its crew return to normal size. But they have other things to worry about as well; someone on board the “Proteus” is actually working for the other side, and uses every means at their disposal to sabotage the operation. Can Grant identify the traitor in time to save the mission, or will Benes die? The movie opens with the attempt on Benes life, and then cuts to the main laboratory of the C.M.D.F. (Combined Miniaturized Deterrent Forces), an organization controlled by the military, where the team chosen to undertake this dangerous task is assembled. These early scenes work well enough, but when I was younger, the only thing I wanted to see when I watched Fantastic Voyage was the mission itself, most of which I found positively fascinating. Once the “Proteus” is inside the patient, we’re treated to all sorts of wonders, including a tense trip through the heart (to ensure the pressure doesn’t tear the “Proteus” apart, surgeons working on the outside stop Benes’ heart for just under a minute, giving the ship enough time to travel from one end to the other) and a rather eventful journey into the lungs (during which Grant is nearly swept away when Benes takes a breath). 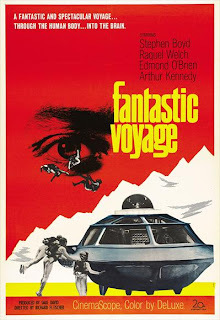 In reality, Fantastic Voyage has quite a bit going for it. The performances are strong (especially Arthur Kennedy as the cantankerous Dr. Duval), and watching the crew deal with each emergency situation that arises during the mission, some of which are caused by the mysterious saboteur, certainly keeps the action flowing. Still, what made the movie for me were the sequences that took place inside the patient’s body. 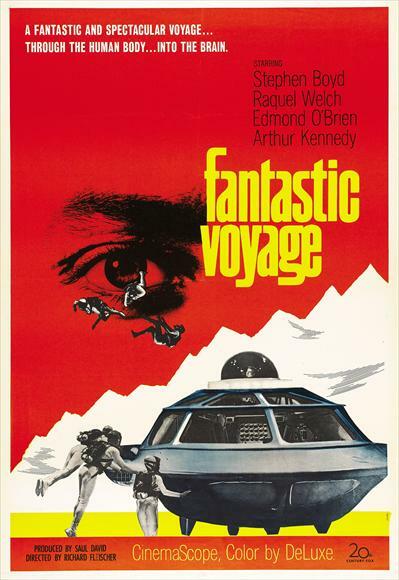 For a wide-eyed kid, these were the moments when Fantastic Voyage truly earned its title. Great reco, totally forgot about this movie, just ordered on Amazon, thanks! I really like your movie review. It is clear, concise, and well written. I was 7 years old when the movie came out and I was fascinated by the story. To this day it remains among my favorites. What I enjoyed most in your review was the way you interjected your own experience with the movie. Truly enjoyable! When I was a little kid I loved this movie. As an adult...all I could do was laugh at it. At the crappy effects. At the thin plot. At the unbelievably silly premise. Despite the presence of Pleasance, and Raquel Welch in a skin-tight suit...it's a floater.